Everyone gets the first 2 lessons of the course free. After you log in you’ll see a page giving you a chance to try Simpleology Elite free for a full 60 days. 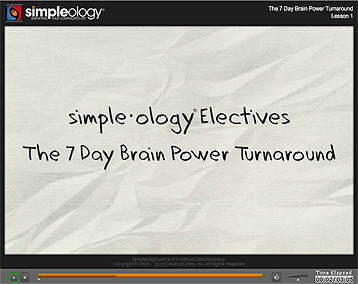 That includes the 7 Day Brain Power Rapid Turnaround Kit, the User’s Guide to the Brain (the perfect companion course), every other Simpleology course available (including 102, 103, 201, etc …), and all of the Elite software features. This end-of-year special offer expires at 11:59PM Pacific Time on December 31st. As with every other course we produce, it includes a step-by-step checklist with easy-to-follow instructions, animated cartoon lessons, quizzes, print outs, and lots of other fun stuff to make the experience pleasurable. Plus, as always, the structure of the course is based on the state of the art of learning psychology to ensure you master the material as quickly as possible so you can start seeing results almost immediately. Warning: while some of the results will be seen almost immediately, you’ll get the best out of this experience if you stick with the program . Consistency is the key to radical change in almost anything, and I can’t imagine a more worthy investment of your time than activities that genuinely boost your brain power.